In no place I have ever lived do so many people seem to be necessary to maintain one house. On any given day, in addition to my efforts, it is likely two or more of the following caretakers will be present: housekeeper, gardener, plumber, locksmith, bricklayer, tree-trimmer, cistern-cleaner, fumigator, carpenter or appliance-repairer. Do things really break more frequently in Mexico? Do locks jam more or garage openers go on the blink with greater regularity? Do more brick pathways need to be laid? More roof tiles slide down and go boom? More solar water heaters spring more leaks? Do pools develop cracks more easily and pipes pop open just for the fun of it? Do houses cry out to be added onto? In my sixteen years of living here, it certainly seems so. I especially remember the day described in THIS POEM as being one where the entire world seemed to be directed toward the care of my house. It was the monarch. We were its slaves. The prompt today was tend. I think this photo also qualifies for the Thursday Doors prompt! This entry was posted in Daily Post, Daily Prompt, Houses, Humor, humorous poem, humorous poetry, Humorous Rhymes and tagged Daily Post, Daily Prompt, poem about house maintenance, tending house on February 8, 2018 by lifelessons. Maybe it is simply that the local economy is so based on services that they happen more often. I saw that with condo communities in the US where frankly a lot of what happened was make-work to justify having so many workers, especially if, say, they usually had snow that time of year and didn’t this year, so they would just let the people loose to ruin anything in sight like trees and plants until they were needed for snowplowing. Here near Woodstock NY there seems to be a clear economy of fixer-upper folks, many of whom (the older ones) know their work so excellently that they are invaluable. A lot of times younger untrained folks especially, like so-called ‘landscapers’ in the US, just plant inappropriate plants that then die, making more work for themselves later. 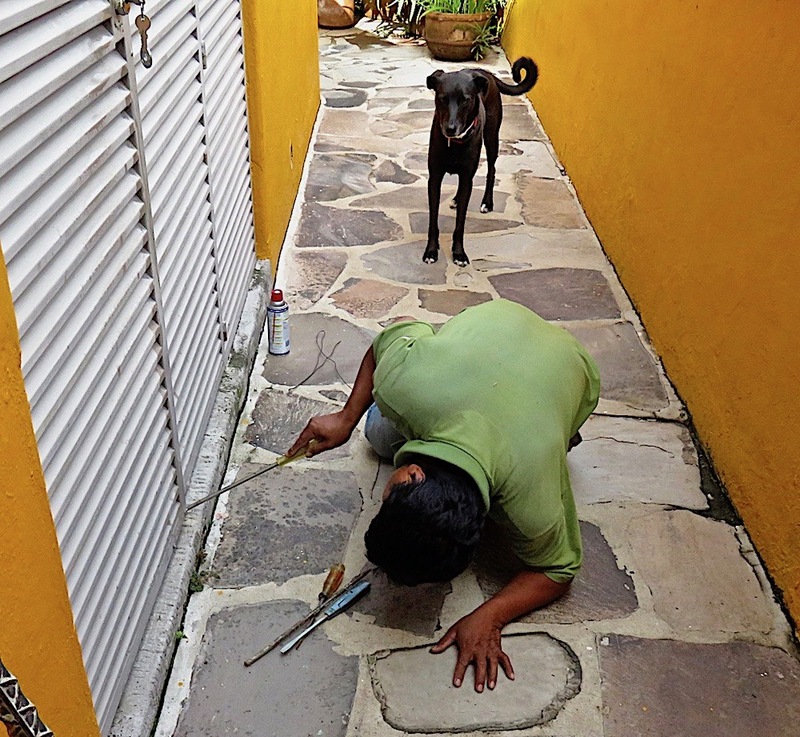 Some workers are like that, just doing that sort of poor-enough-quality work that it needs to be done again and charged for again, especially for second homes and tourists and elsewhere where the homeowner is not there all the time to keep an eye on things. Some workers fortunately are really good and helpful and know their jobs and do their jobs well. That’s the kind I want to know! Part of it is due, true, to improper initial repairs, but houses tend to be larger here and to have numerous bathrooms. Water systems are often complicated, as are the electrical systems. Also, labor is affordable. I never had a gardener before moving to Mexico, and only an occasional housecleaner or window washer. Here, you are right, it is part of supporting the local economy to employ regular helpers and oh what a joy to be writing blogs instead of mopping floors. Everyone profits. And, the concrete, brick and metal workers are so skilled with hand-building that it is hard to resist adding on storerooms, studios and spare rooms. Always something under construction, it seems. It’s great that the workers are actually good at what they do, espcially in handwork. That would make it more pleasant and less likely to cause resentment than if it’s poor repairs that have to be remade over and over. Enjoy your endless creations and maintenance! Ha..Story of my life. Constantly rewriting my poems and blogs as well. I heard of a famous painter they banned from the museum because they’d find him touching up his works!!! That’s funny–the person just couldn’t let it go. Just did a bit of research. It was Pierre Bonnard, who got his friend Edouard Vuillard to distract the guard while he sneaked in and added a new color to a painting he felt was improved by it. Ha! Looks like the supervisor is doing a great job. ;o) You always build me up. Now you got it right!!! I like your house tending issues a lot better than mine!